Upanisad-s are the philosophical portion of the veda-s.
Its poetic diction, systematic development of thought-at once clear, concise and scientific in arrangement of highly philosophical ideas make Kaivalya Upanisad one the most striking minor Upanisad-s. The great commentator Narayana calls the Kaivalya Upanisad as the Brahma- Satarudriya i.e. the Satarudriya which glorifies the unconditioned Brahman as opposed to the Personal God, Lord Siva of the original Satarudriya. True to the Upanisadik style where story form is considered as the most apt devise to make the subject easily intelligible to the readers, in this Upanisad Asvalayana, the great teacher of Rg Veda is a disciple and Lord Brahma, the Creator himself is the teacher, which makes this as the most valuable amongst the 'minor' Upanisad-s. The other Upanisad-s are considered as 'Minor'-not an account of their contents, or in the depth of their thoughts, or in the completeness of their exposition but because no commentaries are available from the great Acarya-s. The new initiates are generally prescribed these minor Upanisad-s only after a thorough study of the exhaustive commentaries (Bhasya-s) by the great Masters on five or six of the Major Upanisad-s. Thus, these became 'minor' only with reference to the knowledge the students have already acquired as a result of their study of the "main" Upanisad-s and their reflection on these 'minor' ones serves as an interesting revision of the knowledge already gathered. Kaivalya Upanisad belongs to the Atharvana Veda. Its poetic diction, systematic development of thought-at once clear, concise and scientific arrangement of highly philosophical ideas make it one the most striking minor Upanisad-s.
Satarudriya is a prayer of hundred stanzas very sacred and inspiring involving Rudra i.e. Lord Siva, which forms part of Taittiriya Samhita of the Yajur Veda and was repeated by devotees with ardent faith and total dedication during the Vedik period. The great commentator Narayana calls the Kaivalya Upanisad as the Brahma-Satarudriya i.e. the Satarudriya which glorifies the unconditioned Brahman as opposed to the Personal God, Lord Siva. True to the Upanisadik style where Masters consider the story form as a conversation between the teacher and his disciple as the most apt devise to make the subject easily intelligible; in this Upanisad Asvalayana, the great teacher of Rg Veda is a disciple and Lord Brahma, the Creator himself is the teacher, which makes this as the most valuable amongst the 'minor' Upanisad-s. Repeated reprints had resulted in numerous inaccuracies rendering understanding difficult for new Sadhaka-s. Besides readability was poor in small print. Both these aspects are taken care of in the revised layout, the credit for which is due to Shri Vishwamitra Purl who with consistent perseverance and devotion scrutinised the entire book very minutely to identify misprints, missing words and lines; added diacritical marks 'and pursued steadfastly, the suggested changes/improvements, with the Acarya of Sandipany Mumbai for approval. 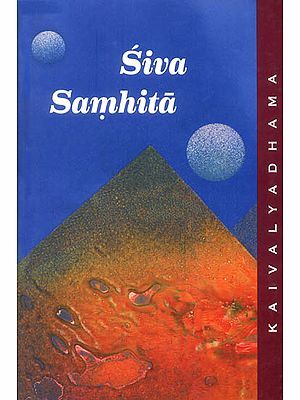 In this revised Edition diacritical marks are used for Transliteration of Samskrta words in the verses as well as commentary. In the 'word-for-word meaning' section also, for benefit of readers not knowing Devanagari, transliteration of Samskrta words is added. Non-English words have been italicised. In the 'free translation' section where the entire text is italicised, to distinguish Samskrta words, 'normal' fonts are used. This will help readers to identify and pronounce the words correctly. The English plural sign's' has been added to the untranslated Samskrta words after a hyphen (-) to show that it is not elemental to the word e.g., mantra-s, Veda-s, Rsi-s etc. Macrons are used on the last letter e.g. 'a, i' of such words to lengthen the quantity of sound in consonance with the pronunciation. To be true to the Samskrta text in transliteration, we have used "brahmana' for the first Varna instead of the commonly used word "Brahmin." 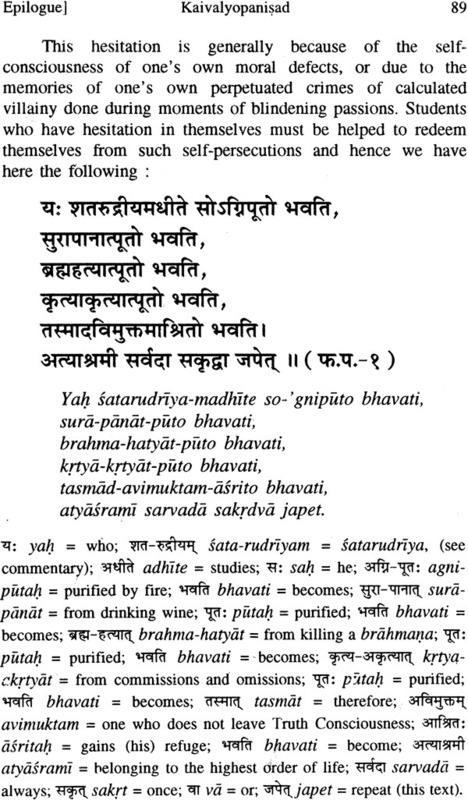 It need not be confused with the term "Brahman" of the Vedantin-s.
A key to the transliteration and pronunciation is added in the beginning and Alphabetical Index to Mantra-s at the end of the book. We are pleased to bring out the present revised Edition of the original commentary given by H. H. Svami Chinmayananda whom we all reverentially refer as Pujya Gurudeva. 'This is our humble offering at His holy feet with a prayer that may His words and guidance inspire us to carry' on His work in all spheres of activities such as this publication of scriptural thoughts for the benefit of the society. 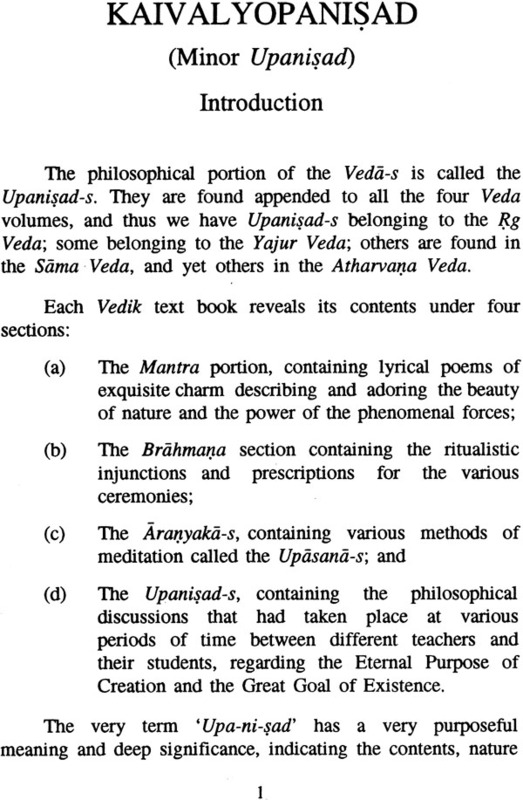 The philosophical portion of the Veda-s is called the Upanisad-s. They are found appended to all the four Veda volumes, and thus we have Upanisad-s belonging to the Rg Veda; some belonging to the Yajur Veda; others are found in the Sama Veda, and yet others in the Atharvana Veda. (d) The Upanisad-s, containing the philosophical discussions that had taken place at various periods of time between different teachers and their students, regarding the Eternal Purpose of Creation and the Great Goal of Existence. The very term 'Upa-ni-sad' has a very purposeful meaning and deep significance, indicating the contents, nature and use of this literature. The Western scholars derive "Upa- ni-sad" from the word 'sad' meaning to sit. When this word 'sad' is preceded by the prepositions 'ni' meaning 'down,' and 'upa' meaning 'near,' then the 'Upa-ni-sad' comes to mean the "near down-sit-literature." The term naturally describes the literature as that which cannot be directly learnt by the student from any given text books, but it is necessary that he should approach a teacher, sit "near" in front of him "down" in an attitude of reverence and devotion, and listen to the teacher's expositions. 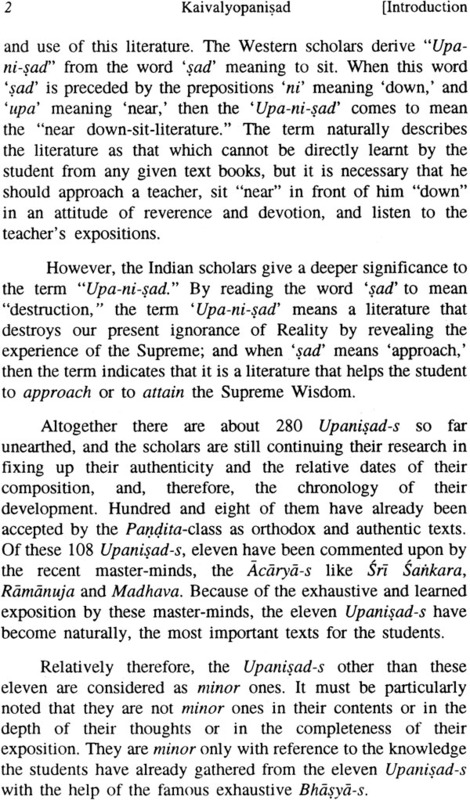 However, the Indian scholars give a deeper significance to the term "Upa-ni-sad," By reading the word 'sad' to mean "destruction," the term 'Upa-ni-sad' means a literature that destroys our present ignorance of Reality by revealing the experience of the Supreme; and when 'sad' means 'approach,' then the term indicates that it is a literature that helps the student to approach or to attain the Supreme Wisdom. Altogether there are about 280 Upanisad-s so far unearthed, and the scholars are still continuing their research in fixing up their authenticity and the relative dates of their composition, and, therefore, the chronology of their development. Hundred and eight of them have already been accepted by the Pandita-class as orthodox and authentic texts. Of these .108 Upanisad-s, eleven have been commented upon by the recent master-minds, the Acarya-s like Sri Sankara, Ramanuja and Madhava. Because of the exhaustive and learned exposition by these master-minds, the eleven Upanisad-s have become naturally, the most important texts for the students. Relatively therefore, the Upanisad-s other than these eleven are considered as minor ones. It must be particularly noted that they are not minor ones in their contents or in the depth of their thoughts or in the completeness of their exposition. They are minor only with reference to the knowledge the students have already gathered from the eleven Upanisad-s with the help of the famous exhaustive Bhasya-s. In fact, some of the Minor Upanisad-s, with their revealing expressions and vivid terms of exposition throw a flood of light to illuminate some of the unrevealed corners in the major eleven Upanisad-s. Very often the Minor Upanisad-s repeat the stanzas and mantra-s of the Major Upanisad-s. In short, after a complete study of the elaborate commentaries that open up the intricate philosophical categories of Hinduism, as expounded in the Major Upanisad-s, to all serious students, these texts become, in fact, elementary and minor: elementary in contents and minor in stature. These Upanisad-s are generally prescribed for all students who ha-ve already gone through an extensive study of at least five or six of the "Major" Upanisad-s. For them reflection upon the "Minor" Upanisad-s becomes, as it were, an interesting revision of what they had already gathered from the "main" Upanisad-s. The Upanisad-s are not creedal. They are not the hasty declaration of a man-of-wisdom under some divine urge. They, in themselves, constitute a science-the Science of Life. Just, as in Physics, we have many Scientists, each one adding to the total knowledge of the world-of-objects by his own theories and discoveries, we have in the Upanisadik lore an array of mighty men, who had enriched its contents by their dedicated investigations in, contemplation upon, and discoveries on the Sources of Life. The Scriptural Realm was thus opened up by them, and each Upanisad invites the student to enter into this glorious world of Light and Knowledge, of Peace and Perfection. No blind promises are found anywhere in the Upanisad-s. Never do the Rsi-s fanatically insist upon any belief. At every stage they closely observe and analyse the known, and very logically deduce the possibilities of the Unknown, and thereafter, they prescribe techniques by which the students can grow themselves into a state of unfoldment in themselves, Wherein they too can come to experience what the Upanisad theories insist upon. The Kaivalya Upanisad belongs to the Atharvana Veda and it is one of the striking Upanisad-s among the "Minor" ones, especially because of its poetic diction, systematic development of thought, scientific arrangement of ideas, as also due to the comprehension of its vision and the richness of its philosophy. There is neither the jarring note of repetition, nor the cumbersome burden of redundancy. Spun from pure philosophy, carefully corded with subjective experience, the ideas weave themselves into a vivid pattern of the attractive Reality. Here too, faithful to the Upanisad-tradition, we have a student approaching a teacher demanding Knowledge. It must be noted that the student here is not of the average type nor is the teacher anyone other than the very Creator (Brahma) Himself. Naturally, therefore, there is no beating about the bush here in the text. The teacher directly approaches the problem, and with minimum words the entire picture of evolution of man and the subtle techniques of attaining the State of Self-realisation have been revealed.